Courage is in every one of us. Sometimes, courage is a little humming voice, guiding you gently on the constant path of perseverance, other times courage is roaring wildly, telling you to go out there and chase your dreams. Taking risks and putting yourself in a vulnerable position is not easy, but practicing small acts of bravery is the key to bigger steps and bold actions. Ten years ago Harm van der Laan decided to do what he loved most, so he ran away and joined the circus. 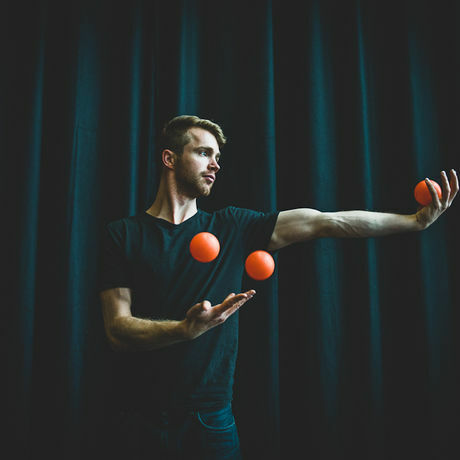 Now he travels the world as an acrobat and juggler. Together with his partner, Maartje Bonarius he founded Tall Tales Company. Together, they create contemporary circus shows about love, loneliness and ambition and fight to get circus accepted as an art form in the Netherlands. Even if contemporary circus gained success and recognition internationally, the Netherlands is still a land to be conquered.